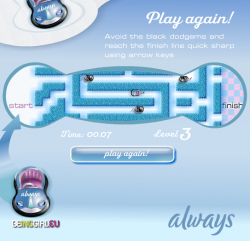 If the idea of playing a game on an Always sanitary towel disgusts you, just imagine how I felt developing this one! Dispite the dubious concept, this little maze game is reasonably fun. Use cursor keys to race across the maze as fast as you can, avoiding the enemy cars.